For the third consecutive year, candidates for the title of Master of Wine have once again paid a visit to Porto and Vila Nova de Gaia before travelling up the Douro Valley to visit some of the regions most famous vineyards. While an important visit for the students, the fact that the Demarcated Douro Region has been recognised by the Institute of Masters of Wine as an important part of the curriculum of such a distinguished qualification, also makes the visit very important for Port, and the Douro Valley as a whole. Founded in 1955, the Institute of Masters of Wine is one of the most prestigious communities of wine professionals in the world. To become a member you must undertake an in-depth three-year program of study, followed by practical and written exams, and the completion of a paper based on original research. Because of the challenge of acquiring the qualification, there are currently only 343 Masters of Wine worldwide. The first stop for the 18 MW students from all over the world who arrived in Porto on the 19th of April was Vinum, the restaurant located in Graham’s 1890 Lodge, for a dinner hosted by Paul Symington. Finishing with Graham’s 1977 Vintage Port, it was a fitting start to what would be three days immersion in the world of Port. The next day saw the candidates participate in a tasting of Graham’s, and other leading producer’s, wines. They then departed for the Douro Valley, where they visited Quinta do Bomfim, another of Symington Family Estate’s prime vineyards, where Graham’s Quinta dos Malvedos’ winemaker, Henry Shotton (also a MW student himself), gave an in-depth explanation of the winemaking process, before being shown around the vineyards. Once again, it was a pleasure to spend some time with the Master of Wine students, and we wish them the very best of luck in their studies. 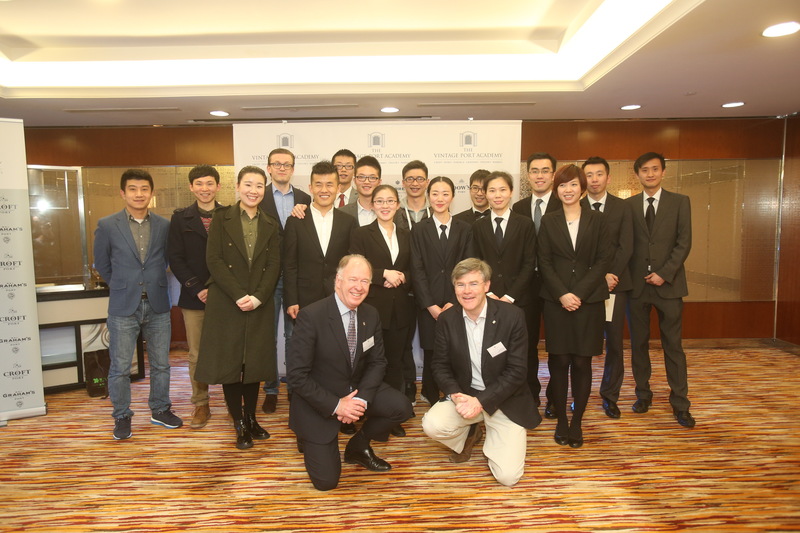 Last month the Vintage Port Academy organised the first Port decanting competition in Shanghai. With eight two-person teams made up of sommeliers and service staff from the city’s leading hotels and restaurants taking part, there was a lot at stake! Formed by Symington Family Estates and the Fladgate Partnership, the Vintage Port Academy aims to develop an understanding and enjoyment of Vintage Port among wine consumers and professionals around the world through a programme of seminars and courses for wine trade and hospitality personnel, as well as tastings and workshops for fine wine consumers, and collectors. 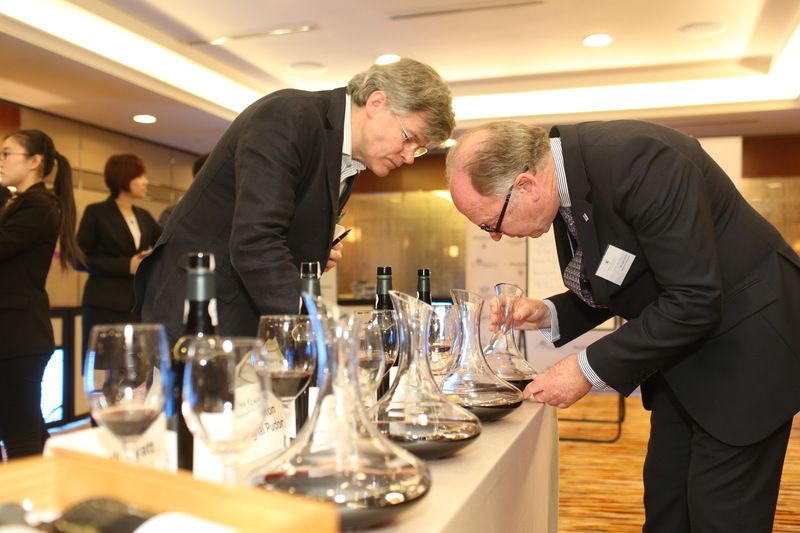 The decanting competition was judged on two elements; clarity (as in the lack of sediment in the poured wine) and wastage. Time would also be used as a tiebreaker if the teams were tied on clarity and wastage. The winning team was Courtyard by Marriott, represented by Lobby Lounge Manager Jessi Peng and Café Supervisor Jacky Ma, who scored 17.5 out of 20 and each received a two bottle presentation box of 2003 Vintage Port. At the beginning of December 2015, the Wildlife Rescue and Recovery Centre (Centro de Recuperação de Animais Selvagens) at the Veterinary Hospital of the University of Trás-os-Montes and Alto Douro (UTAD) in Vila Real, Portugal, received into care a young injured male peregrine falcon. Shot, presumably by hunters, near the town of Esposende on the Northern coast of Portugal, the bird was making his first migration south for the winter. We are happy to report that the bird has made a full recovery and will soon be returned to the wild in time to return to Northern Europe for the summer, this time fitted with a state-of-the-art GPS tracker in order for the centre’s dedicated team to follow its journey. In this video, filmed several months ago, you can see the recovering bird making use of the centre’s octagonal flight tunnel. Symington Family Estates supports the work of the Wildlife Rescue and Recovery Centre and shares with it the values and commitment of protecting and preserving the wildlife and natural habitats of the Douro. We will be following the release of the falcon into the wild at a Symington Family Estate’s vineyard in the near future. In a series of video clips to be shown throughout the year we will be exploring the annual cycle of the vine at Quinta dos Malvedos, culminating in the vintage during September/October. This, the third of the videos, documents bud-break. Bud-break marks the end of winter dormancy and the start of the vines’ new vegetative cycle. With the arrival of spring, buds begin to sprout during March; the timing varies with each grape variety and air temperatures. In a series of video clips to be shown over the year we will be exploring the annual cycle of the vine at Quinta dos Malvedos, culminating in the vintage during September/October. This, the second of the videos, documents vine training and planting. Once winter pruning is concluded, the next task is to train the canes of the young two to three-year-old vines onto the lower wires of the vine trellises, known as the ‘fruiting wires.’ Vine-training in our vineyards follows the Royat single cordon system meaning that the cane (or cordon) is trained horizontally, only to one side of the vine trunk. Starting in February and continuing through March is the planting (or replanting) of vines. Our vineyards are planted from the end of winter until the start of spring of the year after the preparation of the terrain, known as the surriba, which involves the turning over of the topsoil and subsoil, whilst at the same time building the terraces on which the new vines will be planted. In the past the vines were planted in two stages, one year apart; first the phylloxera-resistant rootstock was planted and a year later the scion of the chosen variety would be field-grafted onto it. In recent years the vast majority of our vineyards are planted with bench-grafted rootlings, which already combine the rootstock and the scion. The great advantage of this method is the greater uniformity of the planted vineyard, which thus comes into full production earlier. Hosted by Berry Brothers & Rudd at their historic St. James’s Street offices in London, on Wednesday March 30th four members of the Symington family, together with their friends at Berrys, launched Graham’s 90 Very Old Tawny Port, a limited edition of 500 bottles to mark Her Majesty the Queen’s forthcoming 90th birthday. Paul, Johnny, Rupert and Charlotte Symington presented the special commemorative Port to a group of UK wine writers and journalists, as well as two of Portugal’s leading wine writers. The Portuguese Ambassador to the United Kingdom, João de Vallera, was also present. Charlotte Symington pours the Graham’s 90 component wines in readiness for the tasting. Paul (left) guides the Symington family’s and Berry’s guests through the tasting. Johnny went on to explain that Port has long been used to toast royal and historic occasions by every conceivable British institution for centuries and this seemed an entirely appropriate association. This isn’t the first time that the Symington family and Berry Brothers have come together to mark a royal occasion. In 2012 they jointly launched the Graham’s 1952 Diamond Jubilee Port, which celebrated the 60th anniversary of the Queen’s accession to the throne. Again the challenge was to create an exceptional Port to pay a fitting tribute to the Queen’s dedicated lifetime of service to the nation. Port has always been served at every state occasion at Buckingham Palace and Windsor Castle during Her Majesty’s long reign and this has helped to project Port as one of the world’s premier wines. This rare Port will be available in the UK exclusively through Berry Bros. & Rudd as from March 30th 2016 and will be priced at £700 per bottle. From each bottle sold, a contribution will be made by Graham’s to the Patron’s Fund, which supports a collection of UK and Commonwealth charities of which Her Majesty is the patron. The minimum contribution guaranteed by the Symington family is £10,000.00. A very restricted number of bottles will be available for sale in Portugal, some of which at the Graham’s 1890 Lodge.